The legendary anime production company from Japan, Studio Ghibli, is one of the biggest forces in anime movie-making. Their two leading filmmakers, Hayao Miyazaki and Isao Takahata, have had their work celebrated with new showings of their best and latest films at Luna Palace Cinemas. This event comes at a melancholic time as this wonderful filmmaking company beloved by audiences for decades is now retiring. It seems appropriate, now more than ever, to show from these classic films; from 1988 to the present, alongside a documentary on each film maker about their dedication and love for their craft. The Wind Rises What may or may not be Miyazaki’s last film, this WW2 era film focuses on Japan’s journey into flight, for battle in the war and for transport and travel. Looking through the perspective of intelligent plane designer Jiro Horikoshi, it’s in true Miyazaki style that our main character, despite the war-torn environments he sometimes finds himself in, is a cheery and optimistic fellow with a passion for engineering new planes. Though this film has the usual upbeat mood from Miyazaki, it holds darker themes as well. Though there may be a severely underwritten love story that could’ve worked better, this is a spectacle of animation that ought to be seen on as big a screen as possible. 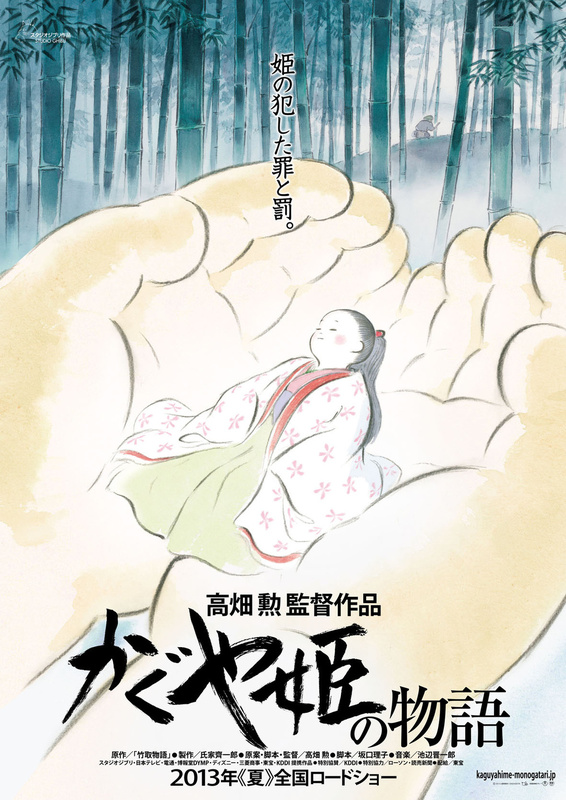 The Tale of the Princess Kaguya An anime with a story as unusual as its animation, an old bamboo cutter finds a small woman, Kaguya, within a shrine in a bamboo stalk. She develops into a baby and grows quickly into a young girl then into a young woman. The bamboo cutter and his wife force this mysterious Kaguya into the life of a princess, which she rejects vehemently. The sort of character progression here for Kaguya is tiresome to watch because of how ancient and familiar it is: her defiant actions are predictable. But this anime is worth watching for the animation alone. Its slightly crude watercolour-like appearance has a comfortable charm to it that works well with the whimsy of its maker. 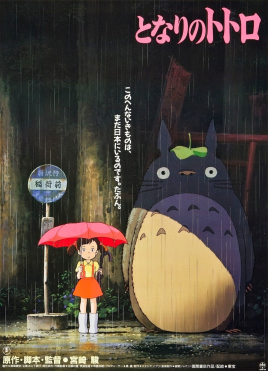 My Neighbor Totoro – It’s hard to pinpoint when Miyazaki become a Japanese icon, but this film is most indicative of his renowned status as any film he made in the ‘80s and ‘90s. 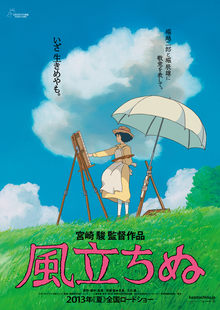 Unlike The Wind Rises and many of Miyazaki’s other films, there is hardly any conflict in the film at all – he gets away with his incredibly joyful and fantastical tale of two little girls finding a strange monster (and other delights) in a forest near their new home. Maybe this will be too cutesy for some adults, but I found it to be a film that embraced entirely its child-like charm and is a joyful escape into a world of believable fantasy and wonder. 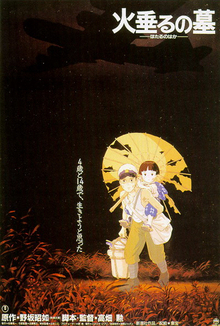 Grave of the Fireflies – The other anime classic from 1988, though all the purejoy My Neighbour Totoro leaves you with can be easily negated by this bleak anime classic. Similar to The Wind Rises, Takahata sets his cheery tale of characters within war-ravaged Japan of the 1940s, and unlike The Wind Rises sentimentality doesn’t win out in the end. This film of a young boy and his younger daughter trying to struggling to survive cemented itself as an enduring classic despite having one of the most depressing endings of all time. Also playing at the showcase (that I wasn’t able to see) were two documentaries on these filmmakers making their latest films: The Kingdom of Dreams and Madness and Isao Takahata and his Tale of Princess Kaguya. This was a wonderful festival of the films of the two great masters of Japanese animated cinema. Hopefully we can have another in years to come, with hopefully more films from these two. We can only hope Studio Ghibli can be resurrected in some way or another, as it wouldn’t feel right to have world cinema without them.